With its folding metal hardtop, the heavy previous-generation BMW Z4 was more of a cruiser than an out-and-out sports car aimed at the Porsche Boxster. The next one, first previewed in concept form yesterday, will reportedly be different than its predecessor. Automobile Magazine reports that BMW has ditched the folding hardtop for the Z4 and is targeting a weight of 3000 to 3200 lbs. The outgoing Z4 weighs over 3200 lbs when equipped with a four-cylinder engine, and opting for two additional pistons adds an additional 300 lbs. 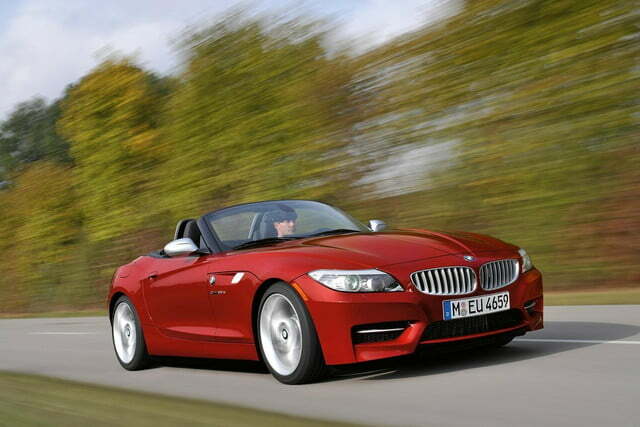 If Automobile’s report proves true, that means the next-gen Z4 will see a significant weight savings. BMW is apparently keeping weight down by eschewing heavy tech like rear-wheel steering, and all-wheel drive. For reference, Porsche says both the standard 718 Boxster and Boxster S weigh around 3000 lbs—a little less if you opt for a manual, a little more with an automatic. The 340-hp Jaguar F-Type V6 weighs around 3500 lbs by comparison. Automobile reports that the Z4 will get two turbocharged engine options—a 2.0-liter four-cylinder making 180 hp in the s20i model and 248 hp in the s30i, and a 3.0-liter inline-six making 320 hp in the M40i. As we’ve reported before, there won’t be a full-on M version of the Z4 but BMW is considering a “Competition Package” for the M40i that’ll bump output by 40 hp. A six-speed manual will be available, with an eight-speed automatic optional. All of this info is also good news for Toyota’s long-awaited Supra revival, which shares a platform with the Z4. Automobile said Toyota boss Akio Toyoda himself drove the new Supra in Germany and came away impressed. We hope the information reported here proves to be true. BMW’s 3.0-liter straight-six, a six-speed manual in a roadster package weighing around 3200 lbs sounds like a recipe for a good time to us.